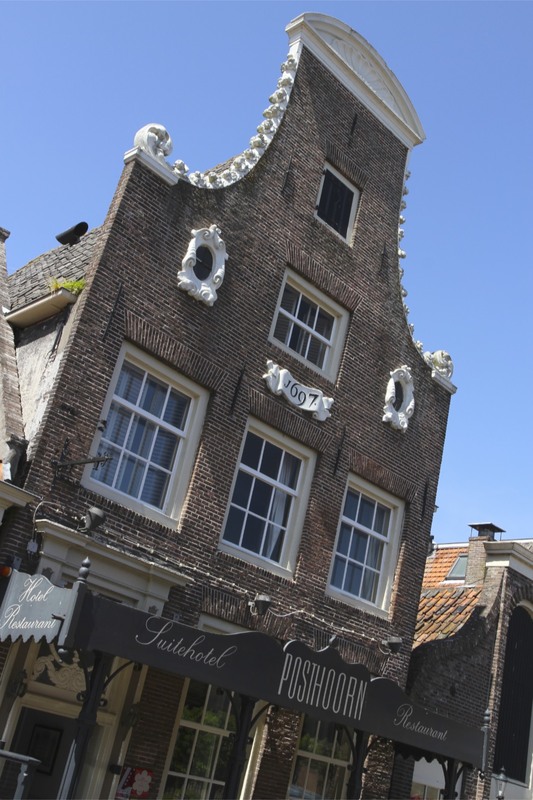 The brash tourism of Volendam came as a surprise after tranquil Edam, as if Amsterdam’s tawdry Martelaarsgracht had been transplanted to the lakeside. The crowds of day-trippers seemed like a good reason for taking the easy way out, and I headed for the exit. 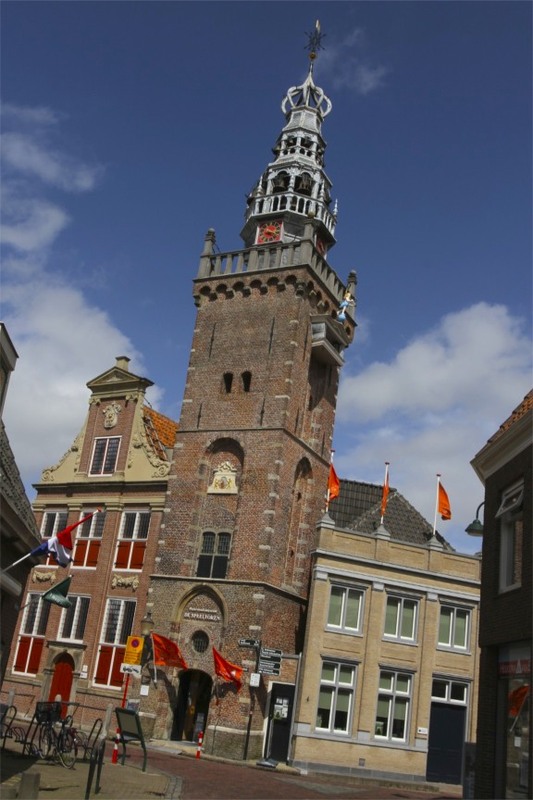 Leaving behind the ‘I Love Volendam’ t-shirts, giant wooden clogs and multiple opportunities to have a photograph in traditional Dutch costume, I cycled the few kilometres to Monnickendam, somewhere I’d seen described as ‘a small town where all is history’. 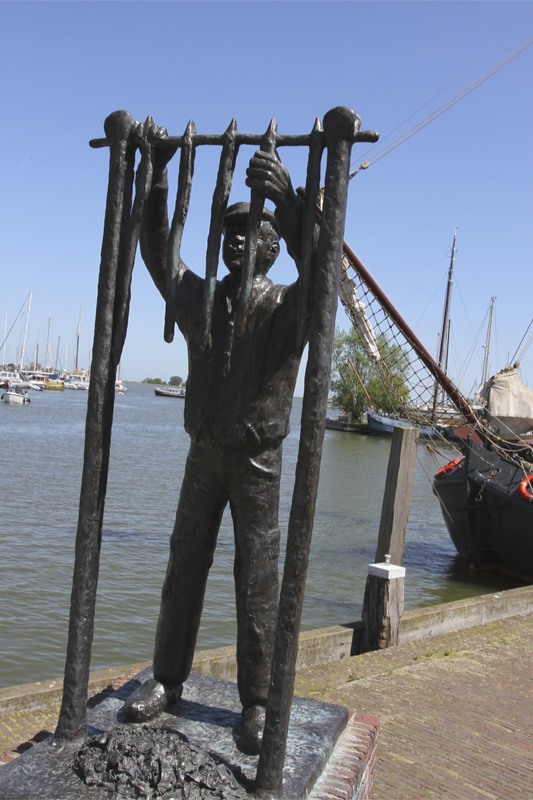 The once proud Zuiderzee fishing fleet that was the backbone of Monnickendam’s economy is long gone; if you’re a whale that’s probably a good thing. 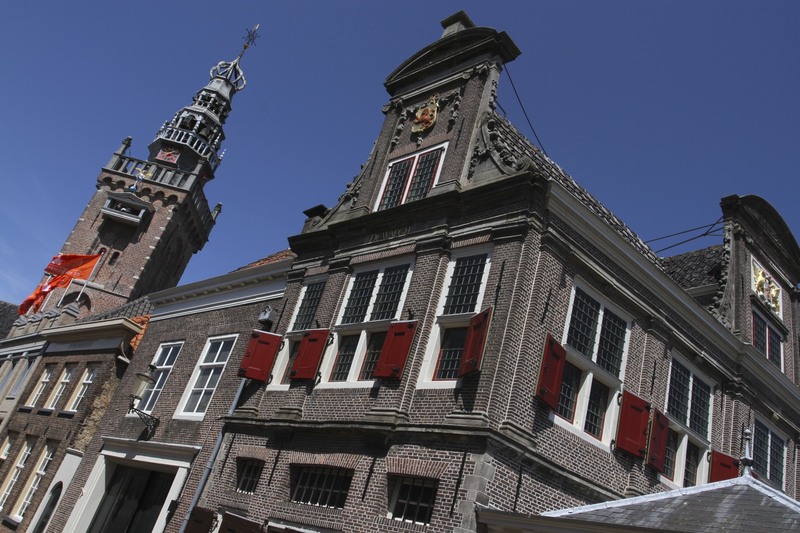 In the 17th Century the town grew into one of the most important Dutch whaling centres. The Dutch led the world in whaling, killing over 30,000 whales in the 17th and 18th Centuries alone, and making vast profits along the way. The town retains traces of the industries, such as soap making, that relied upon whaling; unsurprisingly, it isn’t something that features prominently in tourist literature. 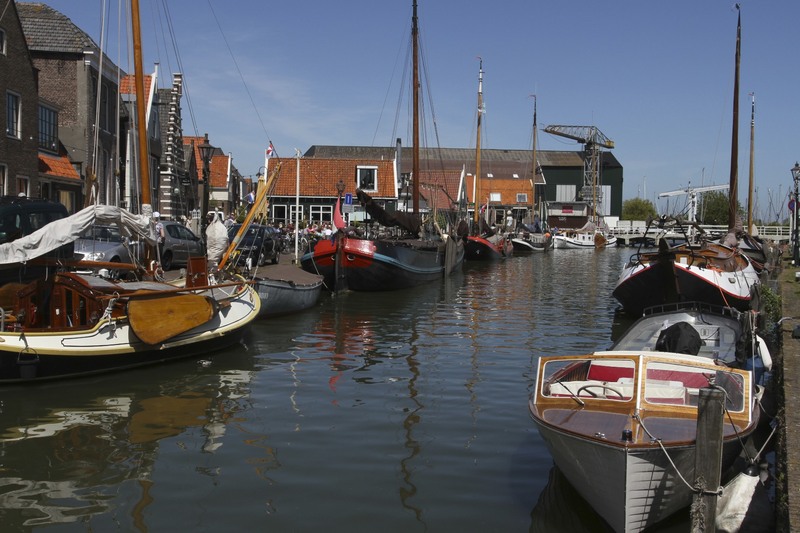 Tourism is important to Monnickendam’s economy, but retains it’s seafaring traditions as one of the largest harbours for yachts and other leisure craft on the Markermeer. 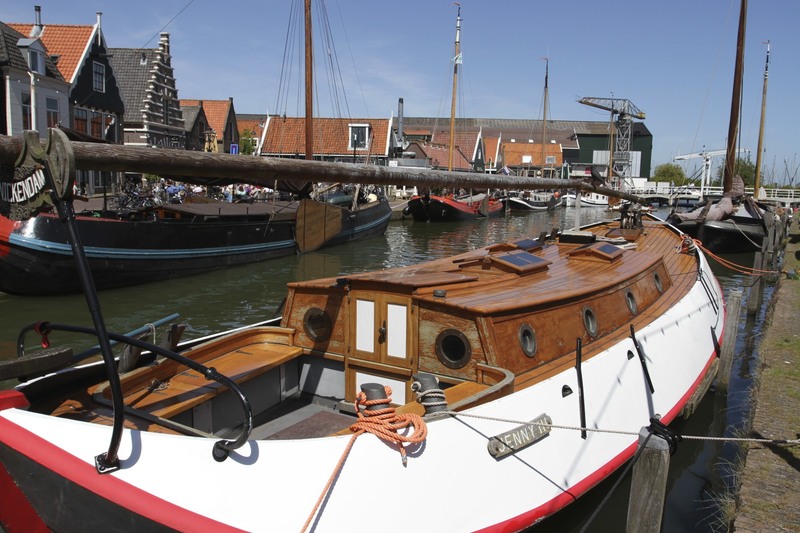 It’s also a working shipyard, centuries of shipbuilding tradition being put to good use repairing and building boats. 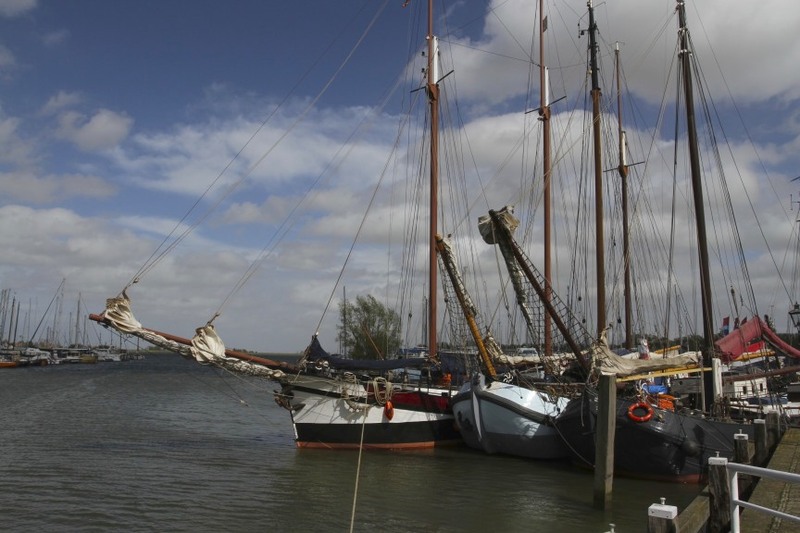 This includes numerous old trawlers, which picturesquely dot the old and new harbours. Things might have been very different had plans to reclaim the land that sits beneath the waters of the Markermeer been completed. When, in 1932, the government built the Afsluitdijk to tame the Zuiderzee, it heralded an ambitious land reclamation project. 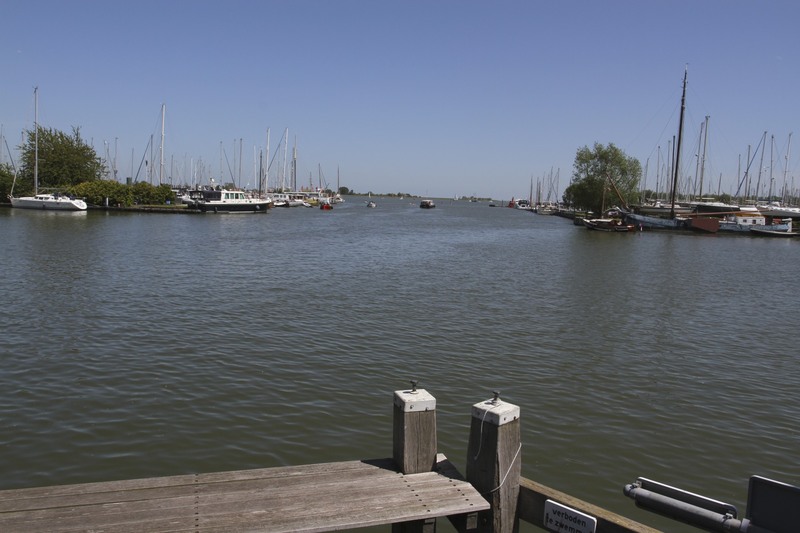 This included the area around Monnickendam. 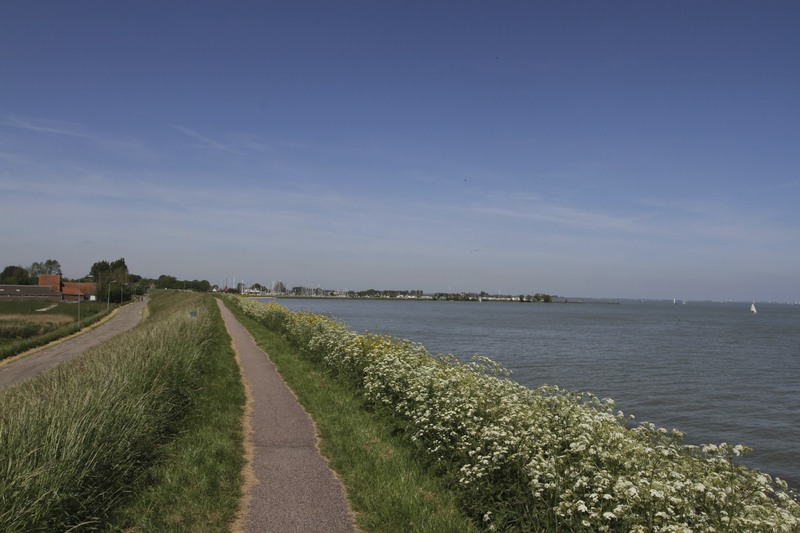 In 1976 a second dam, linking Enkhuizen with Lelystad, was constructed, splitting the Zuiderzee in two and creating the Markermeer – which was to be drained to create agricultural land. 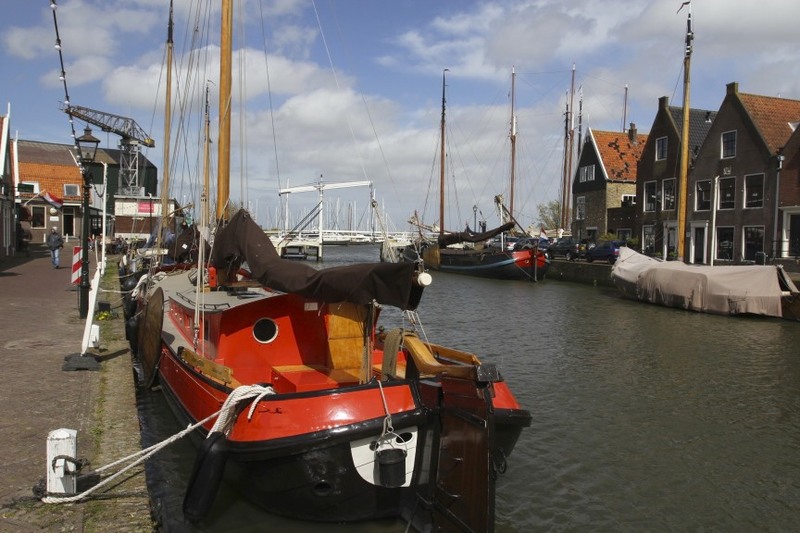 It’s hard to imagine, but Monnickendam would have been left high and dry. Instead of standing on the old harbour and looking out over the waters of the Markermeer, I might have been looking out over fields scattered with cows. This ancient fishing village could have become an agricultural town. 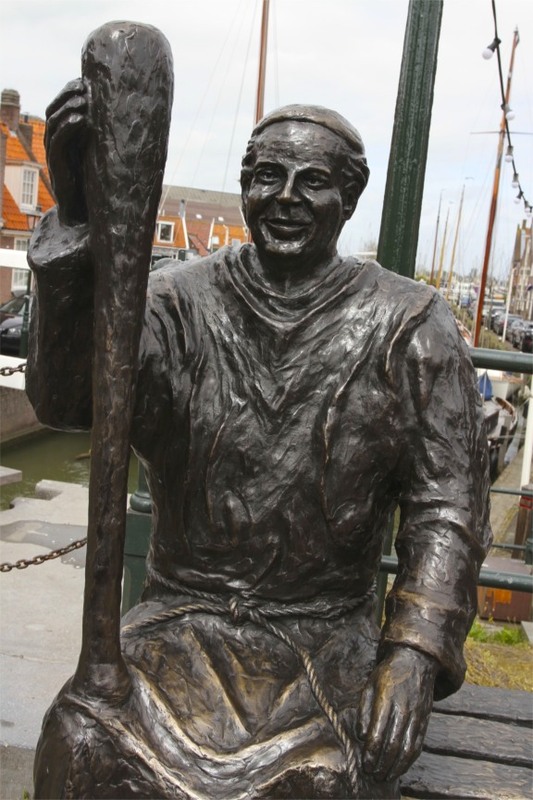 I might not have minded if Volendam had been reclaimed, but Monnickendam would have been a tragedy. Cycling into town I found the old harbour and a cluster of cafes and restaurants overlooking the water. Sitting at one of the outdoor tables in the middle of this lovely town the past surrounds you, the old boats in the harbour reflecting centuries of maritime history. 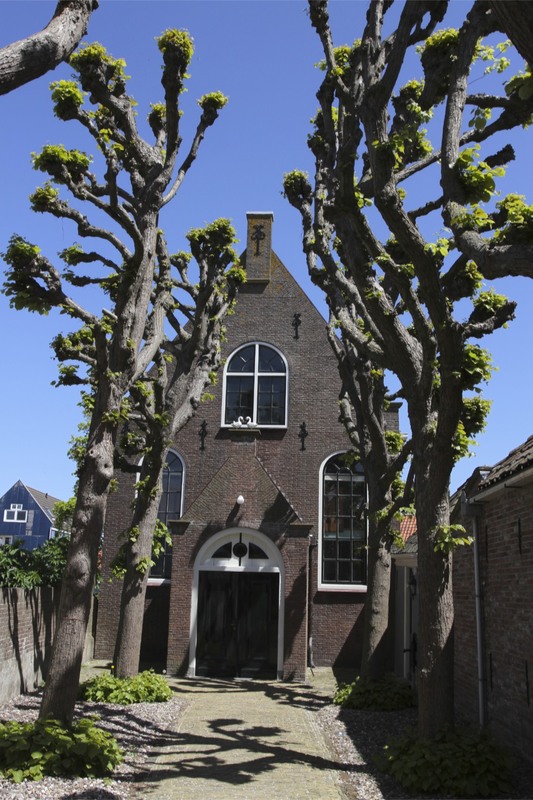 For a sign of the community of monks who gave Monnickendam its name you have to head to the enormous St. Nicholas church; the only other sign of the town’s founders is an alarming statue of a monk holding a large wooden club. Not exactly a recruiting poster for the monastic way of life. 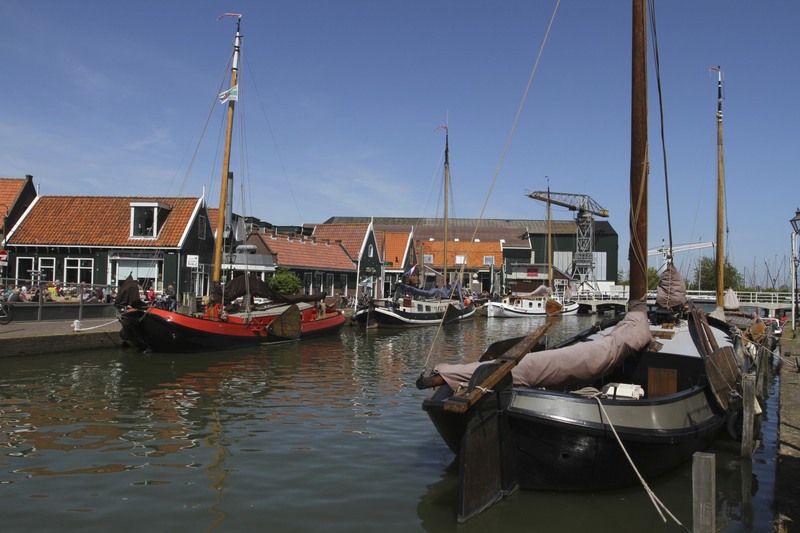 The harbour is Monnickendam’s centre, and walking around the atmospheric narrow streets, beautiful old Dutch houses tilting at alarming angles above, inevitably brings you back here. The old town isn’t very large and doesn’t take much time to explore. I had a stroll then cycled into the interior of the Waterland region, just to see what Monnickendam might have looked like if the Markermeer had been drained.